KARACHI: Muttahida Qoumi Movement MQM Chief Altaf Hussain has directed party leaders to hold referendum across the country on the question of whether to join Sindh government or sit in the opposition. Muttahida Qaumi Movement (MQM) candidate Syed Waqar Hussain Shah was declared winner by a narrow margin of 202 votes after re-polling in the six polling stations of Sindh Assembly constituency PS-128 in the Malir area of Karachi. 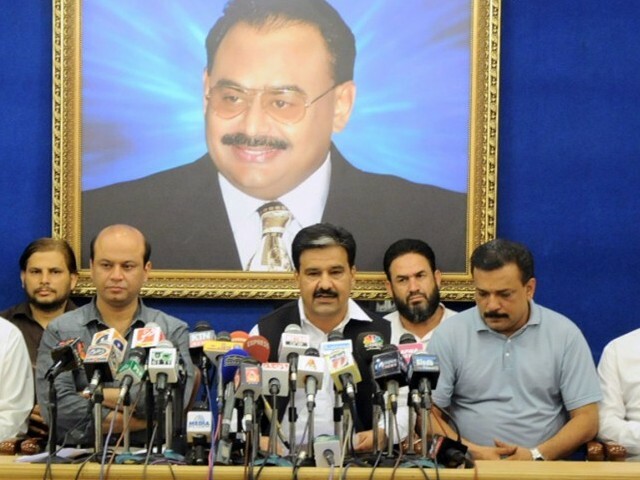 Monday, June 10, 2013 - Karachi—Mutehida Quami Movement chief Altaf Hussain has said, the law enforcement agencies control the gang war element. “The law enforcement agencies control the gang war element otherwise we are able to come over on these terrorists. KARACHI: Muttahida Qaumi Movement (MQM) chief Altaf Hussain has asked workers and office-bearers of the party to recommend one person from their respective sectors to join the coordination committee. HYDERABAD: Muttahida Qaumi Movement (MQM) chief Altaf Hussain has said that liberal and enlightened forces would not let retrogressive forces impose their brand of Sharia on the nation. 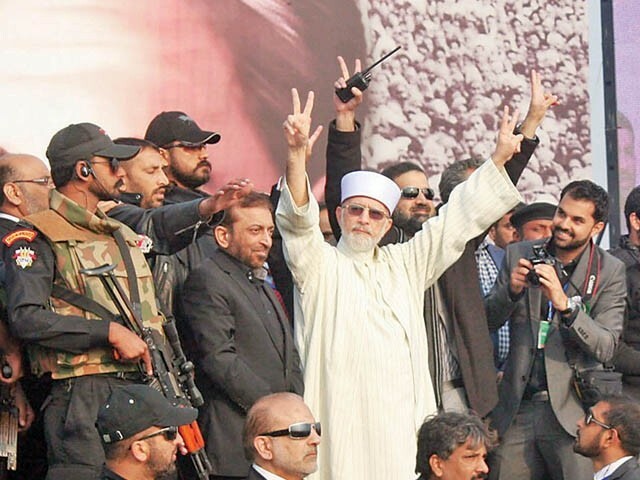 The MQM, ANP and PPP were in high spirits for the elections despite terror attacks, the Muttahida chief declared. KARACHI - Muttahida Quami Movement (MQM) chief Altaf Hussain on Friday said there was a conspiracy underway to give power to right-wing parties in Pakistan by keeping out liberal and enlightened parties out of the electoral process. TANDO ALLAHYAR: Mutahida Qaumi Movement (MQM) Chief Altaf Hussain has said that he is son of Sindh and ready to sacrifice his life for it, SAMAA reports. At least eleven people were injured when armed men on two motorcycles threw hand grenades near an election office of the Muttahida Qaumi Movement (MQM) in Kharadar. KARACHI: A delegation of the Muttahida Qaumi Movement (MQM) met with Caretaker Sindh Chief Minister, Justice (Retd) Zahid Kurban Alavi and told him its reservations regarding law and order situation of Karachi. The Muttahida Qaumi Movement chief has lamented that on the pretext of the apex court’s order that the barriers set up in the no-go areas of Karachi be done away with, Rangers were removing them in the peaceful areas of the city. KARACHI: The Muttahida Qaumi Movement (MQM) has announced names of a few candidates who will contest election from different constituencies of the National Assembly and Sindh Assembly from Karachi and Hyderabad in the upcoming general elections, Geo News reported. KARACHI. : Muttahida Qaumi Movement (MQM) alleged that Rangers’ officials are stopping MQM workers and officials from conducting election campaign, Express News reported. Karachi: The MQM on Sudnay said that the Rangers was stopping the party officials and activists from running election campaign in Karachi, a metropolitan of Pakistan. In a statement issued on Sunday, the coordination committee said that Rangers officials were harrassing the party activists. Karachi: Dr Mohammad Farooq Sattar leads the party in Pakistan in line with the broader guidelines from MQM Foudner & Leader AltafHussain, who is in exile for more than two decades. KARACHI: The Rabitta Committee of Muttahida Qaumi Movement (MQM) Sunday alleged that Rangers were harassing his party workers on the pretext of the ongoing crack down on the criminal elements. MQM will play a major role in the post-election scenario, MQM's Deputy Convenor Dr Farooq Sattar said on Sunday. He said this while talking with media persons after meeting with a delegation of Pakistan Muslim League-Quad (PML-Q), which was led by its General Secretary, Mushahid Hussain Syed on Saturday. Karachi: MQM Chief Altaf Hussain has that a conspiracy is being hatched to eliminate the party from political scenario of the country. Speaking to the election candidates of the party on Friday night, MQM chief demanded to stop state conspiracies against the party. WASHINGTON: United States has strongly condemned the murder of MQM candidate, Fakhrul Islam for May 11 elections in Pakistan, Geo News reported. KARACHI: Unknown gunmen on Thursday killed a Mutahidda Qaumi Movement (MQM) candidate from PS-47, Fakhrul Islam near Halanaka in Hyderabad, Geo News reported. According to police, unknown assailants opened fire on MQM leader and candidate from PS-47 Fakhrul Islam near Halanaka today, killing him on the spot. KARACHI: A Muttahida Qaumi Movement (MQM) leader and candidate for a Sindh provincial assembly seat was shot during a firing incident in Hyderabad on Thursday, Express News reported. Fakhrul Islam had filed papers to contest elections from Hyderabad PS-47 of the Sindh Assembly. HYDERABAD: A Muttahida Qaumi Movement candidate of Sindh’s provincial assembly from PS-47 constituency, Fakhrul Islam was shot to death by unknown assailants in Hala naka area of Hyderabad on Thursday, DawnNews reported. Senior leaders of the Muttahida Qaumi Movement have been trotting the country in recent months, rallying support for the party in Punjab and the Hazara belt. But the party’s main support continues to be in the port city. Karachi is the MQM’s political fortress. KARACHI: Muttahida Qaumi Movement (MQM), chief Altaf Hussain has offered his condolences on the death of former British Prime Minister Baroness Margaret Thatcher. The Mutthaida-e-Qaumi Movement today urged Pakistan's Election Commission to postpone the May 11 polls by 15 to 30 days so that a conducive environment should be created in the country to hold general elections. LAHORE: Mutahida Qaumi Movement (MQM) Chief Altaf Hussain has said that party workers are backbone of the movement and there is nothing more important than those, SAMAA reports. Muttahida Qaumi Movement (MQM) chief Altaf Hussain strongly condemned a bomb attack on a Rangers mobile in the Korangi area on Wednesday. He expressed his grief and sorrow over the killing and wounding of several Rangers personnel in the attack. The Founder and Leader of Muttahida Qaumi Movement MQM, Altaf Hussain has said that MQM has given a revolutionary election manifesto that has been drawn on the philosophy of Realism and Practicalism. Muttahida Qaumi Movement chief Altaf Hussain said on Wednesday that the spread of the MQM’s revolutionary message in every nook and cranny of the country and joining the party by the poor and middle-class people was a great success of the party. Constituencies in Karachi have been redrawn without the completion of a fresh census and the changes should be declared unconstitutional, said the counsel for the Muttahida Qaumi Movement (MQM) on Wednesday. KARACHI: Deputy Convener of Muttahida Qaumi Movement (MQM), Dr Farooq Sattar on Tuesday said that May 11 general elections would prove last nail in the coffin of feudalism. Wednesday, April 03, 2013 - Karachi—Muttahida Qaumi Movement (MQM) Coordination Committee Deputy Convener Dr Farooq Sattar Tuesday announced to commence the election campaign. KARACHI: With reserving 50 percent seats for women, bringing agriculture sector under tax net and holding local bodies' polls, the Muttahida Quami Movement (MQM) unveiled what it calls its 'people empowering' manifesto for the forthcoming general elections on Monday. KARACHI: Chief of Muttahida Qaumi Movement (MQM) Altaf Hussain has highly praised Electoral Manifesto of his party terming it `realistic’ and said that it contains scientific and practicable solutions for progress and stability of democracy. DALLAS: MQM Houston chapter condemned the delimitation of constituencies exclusively in Karachi and called it as a conspiracy to rig the election mandate of MQM. The Muttahida Qaumi Movement (MQM) said on Monday that they will hold local government elections three months after the general elections. KARACHI, April 1: With the main focus on achieving a complete autonomy for the local government institutions, the Muttahida Qaumi Movement unveiled on Monday its 22-point manifesto titled ‘Empowering people’ for the forthcoming general elections. KARACHI: Muttahida Qaumi Movement on Monday vowed in its manifesto for the general election-2013 that prices of oil, petrol and other items would be gradually reduced for controlling inflation and improving the standard of living of the common people. The party also promised in the election manifesto titled "Empowering the People"
KARACHI: Muttahida Qoumi Movement MQM has announced its election manifesto here on Monday. MQM has pledged to strengthen national institutions after it came to power. Presenting party manifesto for elections 2013, Muttahida Qaumi Movement senior leader Dr. Farooq Sattar Monday said that the focus of manifesto was to empower the people of this country. KARACHI: The Muttahida Qaumi Movement (MQM) Monday unveiled what it calls its 'people-centric' manifesto for the upcoming general election. KARACHI: Announcing the party manifesto for the upcoming elections, the Muttahida Qaumi Movement (MQM) expressed a desire to turn Pakistan into a welfare state. This was stated by MQM’s Deputy Convener Dr Farooq Sattar at a press conference in Karachi on Monday. As political parties in Khyber-Pakhtunkhwa and FATA are awarding party tickets to well-off people, feudal lords and industrialists, the Muttahida Qaumi Movement has fielded candidates from a humble background, says a party candidate from the region. PADIDAN: Muttahida Quami Movement Deputy Convener Dr Farooq Sattar has claimed that next Sindh chief minister would be from MQM. Muttahida Qaumi Movement (MQM) leader Dr Farooq Sattar has claimed that next Sindh chief minister would be from MQM. LONDON: Muttahida Qaumi Movement (MQM) head Altaf Hussain on Friday deplored the throwing of a shoe at former President Pervez Musharraf during his appearance before Sindh High Court. Several politicians, including those belonging to the Muttahida Qaumi Movement (MQM) and the Pakistan People’s Party (PPP), filed their nomination papers on Wednesday to contest elections to national and provincial assembly seats. KARACHI: MQM leaders Farooq Sattar and others have submitted their nomination papers to contest upcoming general elections. Muttahida Qaumi Movement (MQM) chief Altaf Hussain congratulated the Hindu community on Saturday on the festival of Holi beginning on Tuesday night. KARACHI: Deputy Convener Muttahida Qaumi Movement (MQM), Rabita Committee, Dr. Farooq Sattar has said his party would not enter into any electoral alliance, however, there is a possibility of seat-to-seat adjustment with like-minded parties and candidates. KARACHI: The Muttahida Qaumi Movement (MQM) will get youth from the lower and middle class of the country elected to the assemblies, said MQM leader Farooq Sattar on Wednesday. Monday, March 25, 2013 - Karachi—Muttahida Quami Movement (MQM), leader, Altaf Hussain Sunday congratulated Mir Hazar Khan Khoso on becoming the caretaker Prime Minister of Pakistan, Geo News reported. Karachi—The Deputy Convener of the Co-ordination Committee of Muttahida Qaumi Movement (MQM) Dr Farooq Sattar and Senator Nasreen Jalil visited the Aga Khan Hospital Saturday to attend the Abbas Town Carnage injured. KARACHI: The Muttahida Qaumi Movement (MQM) rescinded its previous call for a strike in Karachi against the government’s inefficiency after the Abbas Town blast, Express News reported. KARACHI: Sindh Governor Dr Ishratul Ebad on Tuesday accepted the resignations submitted by 11 provincial ministers belonging to the Muttahida Qaumi Movement (MQM). KARACHI: Muttahida Qaumi Movement (MQM) Chief, Altaf Hussain Thursday clarified that Sindh Governor Dr Ishrat-ul-Ebad Khan had tendered his resignation on his own and that neither he (Altaf Hussain) nor the Rabitta Committee advised him to make that move. KARACHI: Muttahida Qaumi Movement (MQM) Deputy Convener Farooq Sattar has said that his party is a coalition partner in the government and it, therefore, will continue to perform its role in stabilizing the democracy. The Muttahida Qaumi Movement (MQM) Coordination Committee's Deputy Convener Dr Farooq Sattar blamed feudalism and hereditary politics for hampering the country's progress and prosperity. Houston: Muttahida Qaumi Movement (MQM) Leader and advisor to Chief Minister Sindh for sports Dr Mohammad Ali Shah has passed away in Houston, a city of United States at the age of 66. LONDON: Muttahida Qaumi Movement (MQM) leader, Altaf Hussain, is improving after a bout of seasonal illness, Geo News reported. Deputy Convenor Rabita Committee of Muttahida Qaumi Movement (MQM) Dr Farooq Sattar announced the new 24-member Central Punjab committee headed by Shaheen Ali Gilani here on Thursday. Malik Waseem Khokhar has been appointed General Secretary MQM central Punjab. Altaf Hussain has condemned the suicide attack outside a mosque in Hangu and expressed sorrow over prayer performers and others’ killings through a statement, issued from London this day. LAHORE: Muttahida Quami Movement (MQM) leader, Altaf Hussain, has said that MQM wants to bring a revolution that will empower 180 million people of Pakistan, and the rule of a few families would end. KARACHI: The chief of Muttahida Qaumi Movement (MQM) Altaf Hussain has said that the party wants to change the corrupt political culture and feudal system by peaceful and democratic means. KARACHI, Dec 29: Speakers at a meeting on Saturday called that a survey be conducted to find out the number of forcibly converted minority community members, particularly young Hindu girls in Sindh, so that a comprehensive report be prepared and discussed with the government. On the brink of a new year, Pakistan faces an unstable future. Can the son of assassinated prime minister Benazir Bhutto break through the chaos? The MQM Coordination Committee strongly condemned the brutal murder of a man by armed bandits when he tried to stop them from harassing his sister. MQM activists today rallied in support of their leader Altaf Hussain and against a Supreme Court order summoning him for contempt of court on January 7. The Pakistani Taliban on Tuesday vowed to carry out more attacks on “secular” political parties like the MQM and ANP, warning people to stay away from their rallies. KARACHI: Muttahida Qaumi Movement chief Altaf Hussain alleged on Monday that certain state authorities were planning to launch another operation against his party in order to crush it. KARACHI - Muttahida Qaumi Movement chief Altaf Hussain on Sunday said it was time for the nation to decide if it wanted the Pakistan of Quaid-e-Azam Muhammad Ali Jinnah or that of the Taliban, and it had to decide whether it was with the Taliban or against them. The Founder and Leader of Muttahida Quami Movement (MQM) Altaf Hussain has directed his party workers to stand up against extremism, sectarianism and terrorism and make Pakistan a progressive and enlightened country. Government coalition members Muttahida Qaumi Movement (MQM) has given the ruling Pakistan Peoples Party (PPP) a three day ultimatum to fulfill their ‘legitimate’ demands. London: Muttahida Qaumi Movement (MQM) Chief Altaf Hussain on Sunday strongly denounced the violence and burning of a Church in Mardan during Yaum-e-Ishq-e-Rasool (SAW) and termed these acts against the teachings of the Prophet (PBUH). As the entire country witnessed the anti-hate film protests turning violent, the Muttahida Bain-ul-Muslimeen Forum organised a peaceful protest outside the Karachi Press Club on Friday. KARACHI: Muttahida Qaumi Movement (MQM) chief Altaf Hussain has urged the armed forces and the government to take “courageous steps” to rid the country of sectarian terrorism. Muttahida Quami Movement (MQM) founder Altaf Hussain has said that a majority of the people of Pakistan do not have feelings of hatred and animosity towards India. Muttahida Qaumi Movement chief Altaf Hussain today expressed serious concern over the ongoing sectarian violence in the country, warning that it could lead to the break up of Pakistan. LONDON: Muttahida Quami Movement MQM leader Altaf Hussain says it was his foremost effort to stop killings of innocent people based on religious beliefs and persuasion, MQM press release said Saturday. LAHORE: Muttahida Quami Movement (MQM) chief Altaf Hussain on Saturday defended his statement in which he said that Quaid-i-Azam Mohammad Ali Jinnah belonged to Shia Asnae Ashary school of thought, DawnNews reported. LONDON: Muttahida Qaumi Movement (MQM) Chief Altaf Hussain in his message of Eid greeted the people of Pakistan as well as Muslims across the world. Karachi: A delegation of Muttahida Qaumi Movement (MQM) header by Deputy Convener Dr Farooq Sattar Friday visited Pakistan Sunni Tehrik’s (PST) headquarters to invite its leadership to an all parties’ roundtable conference proposed by MQM. ISLAMABAD: As political temperature is heating up in the country, MQM delegation will meet JUI-F Chief Maulana Fazl Ur Rehman on Saturday (today). KARACHI: A delegation of Muttahida Qaumi Movement (MQM) led by Dr Farooq Sattar Friday visited Pakistan Sunni Tehrik’s (PST) headquarters to invite its leadership to an all parties’ roundtable conference proposed by MQM, Geo News reported. MULTAN - MQM Rabta Committee Deputy Convener and Federal Minister for Oversees Pakistanis Dr Farooq Sattar has said that landlords and feudals of this region are bent upon making South Punjab another Bangla Desh. Traditional rivals, the Muttahida Qaumi Movement (MQM) and the Jamaat-e-Islami (JI), have announced that national security and the problems faced by the country demand that political parties establish a consensus for national solidarity. LAHORE: In the wake of the current political turmoil, Muttahida Qaumi Movement (MQM) and Jamaat-e-Islami (JI) leaders, on Tuesday, called upon all political parties to work together for national solidarity and holding elections on time. ISLAMABAD, (SANA): Mutahida Qaumi Movement and Awami National Party have agreed on the need for indiscriminate and across the board action against criminals of all sorts in Karachi. KARACHI - An MQM delegation comprising Babar Ghauri, Farooq Sattar, Haider Abbas Rizvi, Raza Haroon and others called on President Asif Zardari at Bilawal House on Monday and discussed different issues including Karachi law and order, extortion and kidnappings in the city. KARACHI: A six-member delegation of the Muttahida Qaumi Movement (MQM) called on President Asif Ali Zardari at the Bilawal House here on Monday. Karachi—The Core Committee of Pakistan Peoples Party (PPP), and Muttahida Qaumi Movement (MQM), held a detailed discussion on various matters pertaining to the Sindh Local Government Act-2012. KARACHI – The Muttahida Qaumi Movement’s Coordination Committee is organising a public meeting of the Pakhtun community, living in Karachi, on June 24 at Jinnah Ground, Azizabad. KARACHI - The Muttahida Qaumi Movement (MQM) Chief Altaf Hussain said that the party’s public gathering at Jinnah Ground tomorrow will spread message of love and harmony among all ethnicities. KARACHI: Muttahida Qaumi Movement (MQM) chief Altaf Hussain has said that the public meeting of the Pushtuns people being held on June 24 in Jinnah Ground, Azizabad would prove to be a landmark for the people of the country, particularly for the Pushtuns. LONDON: Muttahida Qaumi Movement (MQM) chief Altaf Hussain congratulated Raja Pervaiz Ashraf on becoming the 25th Prime Minister of Pakistan , Geo News reported Saturday. A central leader of the Sindh National Party (SNP), Mumtaz Hussain Bhumbro, on Tuesday, joined the Muttahida Qaumi Movement, saying he was highly impressed with the just struggle launched by the party’s chief Altaf Hussain for the rights of the suppressed people of the country. Muttahida Qaumi Movement (MQM) Altaf Hussain has said that it is highly unfortunate to call people who are struggling for the stability of the country, survival of democracy and the basic human rights of the deprived people traitors. LONDON: MQM Chief Altaf Hussain Wednesday said that it was highly unfortunate to call those struggling for stability of the country, survival of democracy and basic human rights of deprived people, as traitors. The Muttahida Qaumi Movement (MQM)’s Coordination Committee, in its reaction to Yousaf Raza Gilani’s disqualification as prime minister by the Supreme Court, said that it accepts the ruling. ISLAMABAD: The Muttahida Qaumi Movement (MQM) on Saturday rejected the proposed tax on the Compressed Natural Gas (CNG) as it advocated that only 30 percent of the total taxes to be imposed should be indirect taxes. KARACHI, June 4: After a two-day relative lull, a surge in targeted killings was witnessed in the city on Monday when five people, including three workers and a supporter of the Muttahida Qaumi Movement, were killed, police said. The death toll in the ongoing round of violence in the city continued to climb on Monday with the murder of five people, including four Muttahida Qaumi Movement (MQM) activists. Two of these killings resulted in a violent reaction that disrupted routine life in the Old City areas. ISLAMABAD: The Muttahida Qaumi Movement (MQM) on Tuesday staged a token walkout from the National Assembly against Karachi law and order situation.MQM member of National Assembly Syed Asif Hasnain had earlier drawn attention of the government demanding across the board action against the criminals.